FlightRadar24: Only useful in certain circumstances, but a pretty shiny way of showing off your new iWhatever. THE CHANCES ARE if you personally didn’t get an iPhone or iPad for Christmas this year, and you’re not a bit jealous about that, you might already be an iPhone or iPad owner. But if you’re one of the lucky souls who opened some wrapping paper this year to find a shiny new iWhatever in your hands, then congratulations: welcome to the leagues of the undead who walk the streets with their new gadgets glued to their hands forevermore. For the sake of simplicity for any new user, the ‘download here’ link underneath the name of each app brings you straight to the App Store where you can download that program. That way, you don’t need to go looking for it yourself. Let’s start with the basics. While for other social outlets like Twitter there are dozen of various apps you can use, for Facebook the imitations are few and far between. Realistically, there is only one proper Facebook app: the Facebook app itself. It’s free, which makes it a good starting point too. Sadly, in the grand scheme of things, it’s not a particularly brilliant app; in terms of the actual functions it does what it’s meant to, but doesn’t do it with any great aplomb or finesse. Still, as with Facebook itself, the app will be indispensible. Download here. As we mentioned, there’s any number of various Twitter apps you can use to access the microblogging service du jour. For free options you can use the official Twitter app, or indeed the one that’s preferred by your writer, the nifty Echofon. But for those who take their Twitter seriously, it’s worth shelling out for Osfoora, a fast, pretty and very elegantly-put-together app that can handle pretty much anything you’ll ever need – including, for example, the ability to attach more than one image to a tweet. Beautiful in its simplicity. Download here for iPhone, and here for iPad. There are any number of different ‘chat’ clients you can get for your new device – apps that build in the function of Windows Live Messenger, AIM, Google Talk and anything else – but IMO is a pretty handy way of taking care of all of them at once. Using this you can keep your Yahoo chat, AIM, Skype, Google Talk, Windows Live (MSN) contacts in one place, and easily manage your various identities for each of those services. Simple, elegant, and free. Download here for iPhone, and here for iPad. You know that feeling of frustration you get when you’re browsing online and you come across a lengthy but really interesting newspaper or magazine article? And you don’t want to print out a physical copy, but nor do you want to spend a few hours sitting in front of the screen reading it all at once? And you just don’t have the time to read it now? The premise of Instapaper is simple: ‘Read It Later’. These apps combine with a bookmark you can put on the toolbar of your web browser. So, next time you find an article online that you’d like to set aside for reading at a later date – just click the bookmark, it’ll be noted, and when you fire up the Instapaper app on your phone or iPad you can read it in its entirety. There’s a free version for the iPhone, and premium versions for the iPhone and iPad. Last week it was announced that the surprise and undisputed iPhone Game of the Year had sold over 50 million copies – netting its makers Rovio Mobile millions. Angry Birds is one of those simple games, done very well: you command a fleet of birds, who seek revenge on a herd of pigs (yes, pigs) after they’ve stolen the eggs containing your offspring. Revenge is sought in a simple way: by battering your birds, kamikaze-style, through the pigs – who defend themselves in progressively more elaborate wooden and stone structures. 79c for iPhone, and €3.99 for iPad. Either is more than worth it for the enjoyment. If the ornithologist in you is a little uneasy about flinging defenceless birds into various structures, then the more leisurely game of Scrabble could well be more appealing for you. There’s little to be said about Scrabble that you probably don’t already know, but what’s great about this app is that it allows for solo play, playing against others alongside you, or playing over a network with friends and strangers near and far. Both the iPhone and iPad versions are on sale right now for 79c each. Another one of those puzzle games where a simple concept is made brilliantly complex. The premise is simple: place a sequence of cogs on the screen so that the moving gear at the bottom begins to move the one at the top. Not as easy as it sounds. There’s a free teaser version for iPhone, before you hand over 79c for the iPhone edition or €2.99 for the iPad one. If you’ve been given an iPad for Christmas, there’s a reasonable chance that the person who bought it for you might have considered getting you Amazon’s Kindle – the electronic book reading device that’s quickly become the standard bearer in its field. Thankfully, to make your iPad that little bit more multipurpose, there’s a free official Kindle app. Amazon have the sales model worked out brilliantly: just go to the Amazon website, buy the Kindle edition of a book, and the new purchase instantly loads itself onto the Kindle program on whatever device you have. There’s apps for the iPhone, iPad, Android, PC and Mac – and you can read your new book on each of them, saving your progress as you go along. Download it here. Apple’s official iPad App of the Year and probably deservedly so. Like most of the other entries in the list, Flipboard is a simple premise made brilliant by how it’s carried out. Flipboard, basically, is a magazine – it turns the stories that your contacts on Facebook, Twitter, Flickr and Google Reader are sharing into a magazine layout, which allows you to easily scan the various stories that your pals find something. Quite simply, words can’t do it justice – it’s worth checking out just to try it. And it’s free, so there’s nothing to lose. Download here. The last entry in our list might not, strictly speaking, be the most useful of the apps in the list, but if you’re looking for something to show off the sheer range of data you can show on your new toy, this one is up there – especially given the travel headaches we’re still getting to grips with. 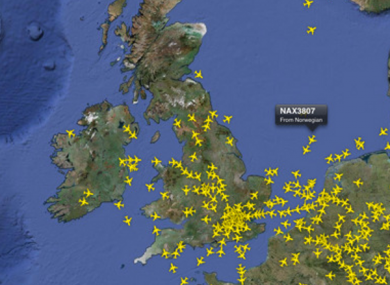 FlightRadar24 simply shows the volume of air traffic flying in any particular area over Europe at that particular moment – tap any individual plane and it’ll tell you what plane it is, and where it’s going. Handy if you’re trying to follow a plane’s physical progress, but still pretty cool if you just want to see how the world is still moving. Download it here. Don’t forget that you can also download TheJournal.ie’s free iPhone and iPad apps right now – making it very easy for you to find the latest news on the go. Email “The 10 iPhone and iPad apps new owners need right now”. Feedback on “The 10 iPhone and iPad apps new owners need right now”.